When you are pushed to a corner in Life by the cosmic design, the best thing to do is to not worry about it. Don’t even complain about being between a rock and a hard place. Just be happy you can breathe. There are times in Life when the journey may become awfully slow. That’s really the time that Life is offering us to enjoy the scenery. But we don’t have the attitude to see it that way. Instead we are obsessed with the painful pace and miss the magic and beauty in our lives. The problem lies with the way we have led our lives so far. Running from event to event, crisis to crisis, trying to make ends meet, earning a living, busy working harder than ever before, meeting targets, paying bills, raising children and doing everything else except living__mindfully. And then as often happens with Life, the game changes. We are put in a spot where we cannot move, check-mated, if you like. Could be a health issue, could be a career stalemate, could be a relationship tangle or could be a legal quagmire. In such times, there may be a tendency to worry and to wish__pray, plead, hope__that why can’t Life fast-forward, why can’t we get back to ‘normalcy’? So, if you are bogged down in an ICU, you wish you could be back in the hustle-bustle of everyday Life. Or if you are caught in the midst of legalese, you just are hoping, why don’t you win all your claims and are free to be away from all this disputing and arguing? Interestingly, Life’s not a handmaiden that will do what you please. It just may not move and you can do nothing about it. 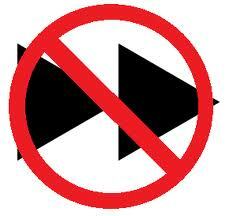 There is no fast-forward button in Life. In such a time, be happy you can breathe. Because being able to sense your breathing is normal. Running so hard that you don’t even have the time to notice you are breathing, is NOT normal. Imagine you are climbing a steep mountain in a vehicle. As it negotiates the sharp hair-pin bends, the engine is finding the going tough. So, the vehicle is down to an agonizing crawl. Now, you can worry about that pace and concentrate on the dreary drone of the engine, or you can look out the window and see what the scenery looks like. This is what enjoying the scenery is all about. “Smile, breathe and go slowly,”advises Thich Nhat Hanh (also called ‘Thay’), a Vietnamese Buddhist monk. “Sometimes your joy can be the cause for your smile, and sometimes, your smile can be the cause for your joy,”he adds. Just being mindful of your being alive__to experiencing whatever you are going through, be it pain, be it joy__is what can make the slowdowns in Life more meaningful. Do all the things that you can joyfully in whatever state you find yourself. And don’t worry about what you can’t. If you are immobilized by a health issue enjoy the ‘grounding’ with a family member who is nursing you; pining to be able to run around will only cause agony. If you are cashless enjoy being able to live without money; hoping you had money will only aggravate your suffering. If you are caught in a relationship problem where there is much misunderstanding, enjoy practicing patience and forgiveness; craving for understanding from the other person may only accentuate your pain. Thay champions mindful living as a cure to all our ailments coming from merely existing. “Life is available only in the present moment. Even drink your tea, slowly and reverently, as if it is the axis on which the world, the earth revolves – slowly, evenly, without rushing toward the future,”he says. 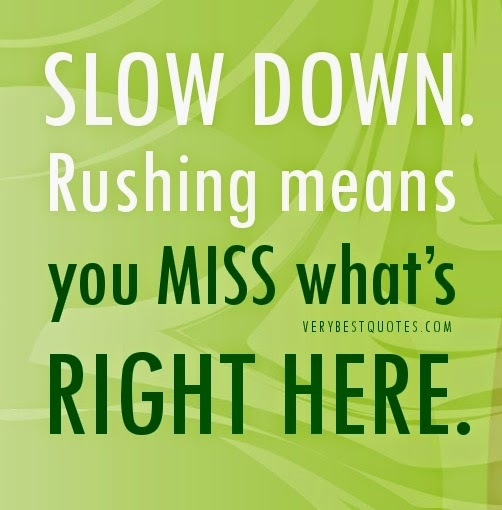 Slow down when Life slows you down. It is only when you go with Life’s pace and flow, that you truly experience the magic in, and live, each moment! When you believe you can no longer go on with your Life, when the odds are stacked against you, when you feel you are up against a wall, when you vainly wish you could simply fast-forward such a phase of your Life, choose a quiet place and think deeply. Ask yourself: why is it that you feel you can’t endure your situation anymore? Is the situation forcing you to want to give up or is it your refusal to accept it for what it is? Be objective. Be practical. Be honest. You will quickly realize that the situation is simply, well, a situation. Let’s say the situation you are faced with is a broken marriage or a phase of acute unemployment or a stifling legal quagmire or fourth stage of a rare germ cell cancer or even something as common as a splitting, unbearable headache. Is the situation the problem or are you, and your inability to deal with it, the problem? Pain in reality comes without suffering. Your belief, expectation, desire, wish, whatever, that it must not exist in the first place, as pain, as a situation, is what makes you suffer! Often thinking deeply about yourself and the way you are receiving and responding to Life helps. But when despite that effort, when your mind slips back into its default self-sympathy mode, it is perhaps a good idea to zoom out and look at Life around you. Almost always, when you stop obsessing with yourself__in sympathy or from grief__you will find how much more blessed your Life is, compared to so, so many peoples’ lives out there! Even wishing a situation doesn’t exist is a luxury many don’t have. Anand Jon surely doesn’t! The only way to be free from suffering is to accept pain: Assuming his cases are not immediately reopened through appeal (at the moment, the family does not have the financial wherewithal to support this) in a higher US court, what other way does Anand Jon have than to accept his Life for what it is? I have no idea how Anand Jon feels about his Life just now. His last recorded sentiment in public is through a November 2010 blogpost. In that he writes: “…I do know that there is a Purpose to all of this and it is beyond my own exoneration. God clearly had bigger plans for me than just influencing the hemlines, and though I can and will win this ordeal, I may not survive it, and this makes me concerned about the pain my loved ones will go through. It is a fascinating concept that I think more about them than myself. My pencil (I only get two per week) is running out of lead, so I also learn patience. Maybe that’s what it’s all about – taming the ego and revealing love…” But, thanks to this reflection this morning, I do have a deeper understanding of how to face the Life that I have been given. Maybe my sharing here will help you too to face your Life situation with equanimity. Because wishing that a situation didn’t exist is what triggers the suffering. And simply accepting that it does exist, and that you can’t do anything about it, is what makes it endurable. Some see this endurance as the indomitable human spirit. Some see it as raw courage. I believe it is nothing but an awareness of the humbling reality that you can never fast-forward your Life. You have to live through some of Life’s grueling situations __ however long it takes. You can comfort yourself though __ that, like Anand Jon says, along the way, you will grow to become more patient, more humble and more loving!